On this day in history, 11th October 1542, Tudor poet, Sir Thomas Wyatt the Elder, died at Sherborne in Dorset. Wyatt was just 39 years old at his death but his poetry, and that of his friend, Henry Howard, Earl of Surrey, is still enjoyed the world over today, although the majority of his work was not published in his lifetime. Literary critic, and author of two books on Wyatt, Patricia Thompson, calls Thomas Wyatt “the Father of English Poetry” and he is known for introducing the sonnet into English. Sir Thomas Wyatt was born in 1503 at Allington Castle, Kent. His father, Henry Wyatt, was a Lancastrian who had been imprisoned during Richard III’s reign, but released on the accession of Henry VII who rewarded him with many grants and titles. His mother was Anne Skinner, daughter of John Skinner of Reigate, a woman famed for her hospitality. Henry Wyatt became a Privy Councillor under Henry VII and acted as an executor for the King’s will on his death in 1509. He went on to serve the new king, Henry VIII and was made a Knight of the Bath at his coronation in June 1509. Little is known of Thomas Wyatt’s childhood, apart from the story of the lion. It is said that Wyatt, or his father, were raising a lion cub as a pet when it turned on Wyatt and attacked him. Wyatt had the presence of mind to grab his rapier and run it through the lion’s heart. When Henry VIII heard of this story, he commented “Oh, he will tame lions”. In 1516, Wyatt served as a sewer extraordinary at the Princess Mary’s christening, along with his friend Thomas Poynings, and later that year was sent to St John’s College, Cambridge, a college known for Humanism. In 1520, Wyatt married Elizabeth Brooke, the daughter of Lord Cobham, and the couple had a son, Thomas Wyatt the Younger, in 1521. The Duke of Norfolk stood as a godfather at the baby’s christening. In 1524, Wyatt followed his father’s example and started a career at court as Clerk of the King’s jewels. In 1525 he was made Esquire of the Body and he went on to become an ambassador, undertaking many foreign missions for his master, King Henry VIII, including one to France in 1526 and one to the Papal Court in Rome in 1527, an embassy to try to convince Pope Clement VII to annul the King’s marriage to Catherine of Aragon. In 1528 he was made High Marshal of Calais and in 1532 he was made Commissioner of the Peace in Essex. 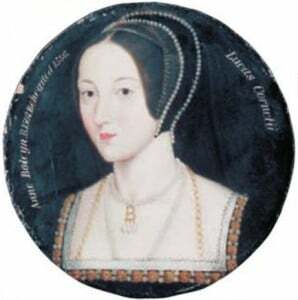 Wyatt was also one of the men chosen to accompany the King and Anne Boleyn on their visit to France in late 1532 and he served Anne at her coronation in the summer of 1533. He was knighted in 1535. Wyatt’s marriage to Elizabeth Brooke was not a happy one and the couple separated around 1525. Josephine Wilkinson, author of “The Early Loves of Anne Boleyn”1, writes of how it appears that Wyatt fell in love with Anne Boleyn when she arrived at the English Court in 1522. 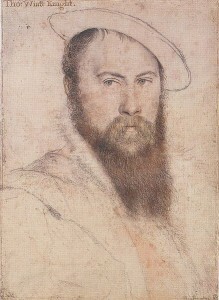 Wyatt’s grandson, George Wyatt, later wrote that when Thomas Wyatt first saw Anne he was “surprised by the sight thereof”2. It was love at first sight for Thomas, but Anne, at this time, was in love with Henry Percy and by 1526 she had a new admirer, the King. Although these poems suggest unrequited love, The Spanish Chronicle3 tells a story of Wyatt visiting Anne at her home at Hever. He finds her in bed, kisses her and touches her breast, but is stopped from going any further by a stamping noise from upstairs, the stamping of Anne’s lover who has become impatient waiting for her! I don’t think it is likely that there is any truth in this story! Another story is told by George Wyatt4. In this story, Thomas Wyatt was entertaining Anne Boleyn with his poetry while she did needlework. Wyatt noticed a jewel hanging from Anne’s pocket and playfully snatched it off her and decided to keep it as a trophy. Some time later, Wyatt was playing bowls with the King, the two of them arguing over a shot. Wyatt declared that the shot was his but the King declared “Wyatt, I tell thee it is mine”, pointing to the wood with the finger on which he was wearing Anne’s ring. Wyatt, seeing Anne’s ring, replied, “If it may like your majesty to give me leave to measure it, I hope it will be mine”, and then took Anne’s jewel from around his neck and began to measure the cast with its ribbon. The King was furious when he saw Anne’s jewel. He broke up the game and then went in search of Anne for an explanation. It is clear that Cromwell warned Thomas Wyatt that he needed to mend his ways and keep his nose clean and that he had asked Sir Henry to keep an eye on his son’s behaviour. Thomas Wyatt was lucky to escape the executioner’s axe and Cromwell wanted both the son and father to know that and to take it as a warning. Although Wyatt escaped Anne Boleyn’s fall and the King made him an ambassador to the court of Charles V, the Holy Roman Emperor, he got into trouble again in 1541 when he was charged with treason for making rude comments about the King and dealing with Cardinal Pole. Wyatt was once again imprisoned in the Tower of London and this time he had no father to secure his release, his father had died in November 1536. This time, it was Catherine Howard, Henry VIII’s fifth wife, who secured his pardon and release, but Wyatt had to agree to return to his estranged wife. In 1542, Wyatt was back in favour and had been restored to his office of ambassador. However, his return to favour was shortlived because Wyatt was taken ill after receiving the emperor’s envoy at Falmouth. Sir Thomas Wyatt died on the 11th October 1542 at Clifton Maybank House, the home of his friend Sir John Horsey, in Sherborne Dorset. 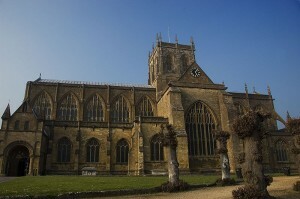 Sir Thomas Wyatt the Elder was laid to rest at Sherborne Abbey. His plain tomb can be found in the Wykenham Chapel of the Abbey. Sir Thomas Wyatt’s son, Thomas Wyatt the Younger, was executed on the 11th April 1554 after leading a rebellion, “Wyatt’s Rebellion” or “Wyatt’s Revolt”, against Queen Mary I. Although he was tried and found guilty on the 15th March, his execution was postponed in the hope that he would implicate Mary I’s half-sister, Elizabeth, in the uprising. Wyatt went to his death protesting Elizabeth’s innocence. Be signe of love, then do I love againe. She hath in hand, my wit, my will, and all. Without whose helpe skant do I live a day. What word is that that changeth not? The solution to this riddle poem is “ANNA”. “ANNA” is a name which remains unchanged when it is reversed and “made in twain” (cut in two). It is a word that Wyatt loves but which causes him pain. “The Life of Queen Anne Boleigne”, George Wyatt, p424, quoted in Wilkinson. Story from The Chronicle of King Henry VIII of England retold in Wilkinson, p81. George Wyatt’s story retold in Wilkinson, p83. Thanks for this illuminating post: legends, documents and all! This is just great. I love reading his poetry about Anne. I do think he was in love with her and I suspect she knew it. He was handsome and could woo with words, just the sort to appeal to Anne. But then, Henry came on the scene and he also wooed with words–his letters are passionate and beautiful. She must have been something to have so many men interested in her—I wonder what she was like really. Thanks for another great post! My sister was taking a Literature class and she had to read some of Thomas Wyatt’s poems. The poems were good, but the brief biography on him was terrible. The biography said that Thomas Wyatt confessed to being Anne’s lover and that the king forgave him because of that. Since I’m the Anne Boleyn expert in my family, my sister was confused and showed to me and then got to enjoy the sight of my face turning sixteen shades of red. She then received a massive rant on my part about how there is no evidence of requited love between Anne and Thomas Wyatt. She then told her teacher the book’s error the class, probably painting me as some Tudor freak but at least her teacher now knows that the book is faulty. I love this site. I finally know that I’m not alone in my interest in the Tudors and Anne Boleyn. Haha! I know that you wrote this two years ago, but I just have to reply. I would have had the exact same reaction!! I think Wyatt said something along the lines of “Queen Anne is so beautiful, every man should love her,” and made it very clear that he never was in a romantic relationship with her. The Tudors and Wyatts and Anne Boleyn are all SO interesting, I wish we spend more time on them in school! Thank you for another really informative article! I’d love to have been a fly on the wall when Wyatt was forced to reunite with his wife- I’m sure it wasn’t a party…. But the poems which he wrote in the aftermath of the executions are to me the most moving of all… a real groan from the heart. I, too, LOVE this site! I look forward to each new posting. I wish all I had to do was poke around here–I still hvae not visited everywhere! Keep going, Claire!! I know how you feel too. Nobody ever understands why I love learning about the Tudor period but I love visiting this site because I know that I’m not the only one out there. It is good to know about history, learn from the mistakes of others, honor their memory, and feel empathy for those who suffered. Jessica, I think it’s a good idea to show how books do contain errors and that you should question the validity of statements made by authors who did not properly research their material. Your sister needs to copy a few pages of one or more reliable books on Anne Boleyn to refute the author’s claim. Speaking as a Wyatt, it don’t matter what his wife looked like. All women are fine, its just that some of them are finer than others. I can’t say that I know much about wives because I have never had one in my 55 years but women I do know a little about. As for the trouble the Wyatt’s always seem to get into, can’t say it is always our fault, many times it was for standing righteous ground. I do however admit to personally standing ground on less than righteous reasons. Maybe that is why I never got married. I think it safe to say, I will not achieve gaining a wife before slipping out of this life again. I also think it safe to say as a Wyatt, if I did gain a wife she would look very good. For now, I will stay hidden at my sanctuary I call “Dirtwater” and ponder what I am learning about my family history. At this point I can only reach back to about 8 BC and unsure how accurate anything before the 1400’s. Also speaking as a Wyatt, I agree. Do you know about the Wyatt who was the first Royal governor of the Virginia Colony. I won’t say much about wives except that I have 3 great kids from one before she packed up and left. Yes, the Wyatt family history is interesting. Even with all their faults, and there seem to have been plenty of them, they were IN with the royalty of Britain. I was privileged enough to actually read the documents of correspondence concerning the Wyatt family members who were in Virginia. Your ancestors left behind such a treasure trove of riches, now at the British Library. My hands shook as I touched the pages of letters between Henry Wyatt and Henry VII, letters from Thomas Wyatt, essays by George Wyatt – I still get light-headed thinking about it. Primary source material is the Olympic gold medal for anyone who loves history. We are also descended from the Wyatt family through the immigrant Haute Wyatt (who returned to England and died there) and his son. The Wyatt name was used in the family for years and years as a first name. Thank you so much for this fascinating study of Wyatt the Elder. I love Wyatt! There’s also this, written in 1532 about the journey Henry and Anne made to Calias. Meshed in the briers that erst was all to-torn. I always think this has the stamp of real emotion on it and that Wyatt really suffered over Anne – but did get over her in time. Thank you so much… I will be forwarding this on to my father, Ralph Wyatt. I am born and raised mostly in East Texas. Hiding out here on my place I call Dirtwater about 80 miles east of Dallas. I’m in Idaho. But I’m from Ohio. My father, Henry, was from Virginia. Hey cousins! My family also comes from the Wyatt/Wiatt family that settled in Virginia during the colonies. I am Fred Wyatt and I too am a descendant from those at the British Colony in Virginia, as some are still there. I am living in California and I know many of you Wyatt’s out there are my family and I say hello from California! Great post and great sources and poem extracts. However, it is unlikely that it was the pleadings of Katherine Howard that obtained his release. Although she is known to have batted her eye-lashes a few times and Henry listened to her to pardon a couple of criminals; including her cousin the royal cook who was about to have his hand cut off and asked to be pardoned the right hand as he needed it, and Henry granted him a full pardon; she was not that influential over Henry at the time of his imprisonment of Thomas Wyatt. It is more likely a combination of factors that gained Wyatt’s release in 1541. He was good with words and his appeal to his judges and the council, including his defence and a letter to the Duke of Suffolk asking for his help, are all cleverly worded and reverse the role of the judges in assuming that he is guilty. His defence is a great work of prose and was published. It is also a frank confession and the council could find no evidence of any plot. Henry also genuinely liked Wyatt and his poems and he was clever as an ambassador. On top of all this, Katherine’s pleading for him came at the right time and the King consented to his release. However, note the terms of the pardon: he is almost on bail rather than an actual pardon, with strict terms. For one thing he had to return to his wife under pain of death, and the slightest hint of any criticism of the King or suspicion that he was again involved in anything and the original trial would be carried out with the obvious consequences. It is little wonder that he did not live much more than a year longer: he must have lived in fear of his very life. Wow this article helped me with my poetry assignment to no end. ‘Whoso list to hunt’. I know nothing of poetry and this helped greatly. Old Thommo just couldn’t help himself I think he liked prison food! I wonder if his wife poisioned him in the end? It would be the equivalent of being married to Mick Jagger. C ouldn’t be faithful and the whole world knew and if they didn’t he wrote it down and made it public!!! He didn’t really love her, and she didn’t really love him. Actually, King Henry VIII is believed to have had some sort of romantic relationship with Elizabeth Brooke after he tired of Anne Boleyn. Yeah, how about those Wyatt’s! I had no idea that this was going on. My name is Fred Wyatt and this individual is my 15th Great-Grandfather and up until today, 9-24-17, none of this was known to me. I have been researching my family history for about a week now and I have come across some interesting stuff, but this was the prize so far and this is only my fathers, fathers side, just the beginning. Thank you all! Thomas Wyatt is my “historical crush”-if I could buy a drink and chat with any guy from history it would be him. Wait a minute, Melissa, he’s MY historical boyfriend!!! hahaha!!! Sir Thomas Wyatt is my 17th great grandfather from my mother’s side. I have my college degree in European History, specializing in English and French studies. How I wish I had known all of this while in school. Now I know why I have been fascinated with this time period and the events of English History. Thank you for publishing the lessons. I now see that gene’s do have influence on ones life. I have been digging into family history and find many things that answer questions I have had on why I do the things I do. Go figure that one. It’s all in the genes. It is amazing how the names remain in the family history as well. Do any of you bear resemblance to Wyatt? My husband could be his brother! The poems give me goosepimples, but my main purpose in writing is to deal with Henry Wyatt. It is usually said in any biography of Henry Wyatt that he was imprisoned by Richard III. Accounts frequently go on to state that he was imprisoned by Richard III in the Tower of London. When Richard III was king, Henry Wyatt was in Scotland. He spent the entire reign there, returning to England only after the battle of Bosworth. He was therefore never a prisoner of Richard III. Regarding supposed imprisonment in the Tower of London, a record was made when anybody was imprisoned. His name does not appear on the record. The full letter can be read at http://bdespain.org/gencol/famhis/ex41060.htm. It is hard to know whether Wyatt means that his father was imprisoned in England and Scotland, or just Scotland. Excellent link. Yes of course Richard iii spent the entire two years of his reign personally overseeing the torture of Sir Henry Wyatt, he had nothing better to do. More Tudor propaganda and Wyatt probably spun a great tale the same as his son. The records are sketchy and there are numerous versions. He was probably imprisoned after a legal trial for contacting Henry Tudor. However, I would assume that he was deemed to be far from a high risk as he would have been executed for treason. The use of torture was far less in Medieval England than under the Tudors so the story is nonsense and another attempt to blacken Richard’s name and get in with Henry Tudor. Wasn’t it his sister Mary Wyatt who was said to be a good friend of Anne? I heard that she gave Mary her little book of devotions on the scaffold, it must be in a museum somewhere, Anne would have known the Wyatts as they were neighbours in Kent, I think it was just a flirtation on Anne’s part, Wyatt was said to be handsome, he was definatley witty and she was probably enjoying the attention, I must admit I do like the painting of her above she looks so young in it, and her hair is very dark almost black as it was said to be, unlike the chestnut hair in her other portraits. Wow. This is quite a sight. I am also the direct decendent of sir Thomas Wyatt senior etc. My name is Christine Wyatt Bowra.. I was raised in California but reside in northern Arizona. I found so much of the history so very interesting. First it was a shock when I found my genealogy papers of all these names way way back. Then to find that he had been a poet etc. as I have been a song writer and poet. Many interesting things, too many to mention. I am also a descendent of Sir Thomas Wyatt. My family settled in Charleston sometime before the civil war. I have always felt a strong connection to Sir Thomas Wyatt and Queen Anne ( yes I’m aware that is not proper to refer to her as such but to me she will always be Queen). I became obsessed with them around age 12 unaware at the time that I was obsessed with my own ancestor. It wasn’t until I was in high school that my aunt met a distant relative of ours who lives in England online and he sent her several copies of a two volume book of our geneology( pardon my spelling) he had written that we learned our heritage. Of course I was overjoyed, to say the least , to discover that I am a descendent of my hero. Personally I’ve always felt that he loved Queen Anne, who wouldn’t!!!! Great to see so many cousins are fans too!!!!!! I wonder what these rich people did,inTudor times,during the day.In an estate where they would probably have a manager,there is only so much you can do.I presume they got up with the early light and went to bed reasonably early,to save on candles and fires. I guess the women would be busy with running the house and giving orders for food etc.but the men would not get involved in that,so perhaps they read a lot or generally moved around the manor.Pehaps that’s why they liked being in Court,as it was more interesting and stopped the boredom. They hunted a lot I should imagine the men that is, and visited each other, there was archery they could engage in and other sports such as tennis and football, the ladies would spend their days also visiting their friends and gossiping, needlework and reading and singing were popular pastimes, also practising the latest dances at court, they would also learn how to distill herbs and young unmarried girls would learn how to run the household for when they bacame wives themselves, their meal times varied greatly to ours and lunch would last for several hours, it’s a different world from ours as we know it. You sound just like me!!! I wonder those things myself:) most be a family trait!!!!! Sir Thomas Wyatt is my 13th great grandfather on my father’s side. I love hearing these stories as well. I would love to travel to Europe and visit Allington Castle one day. This is cool and informative post, but this is not complete. Please add some saying of other poets about this great person. Charles Scott’s Father Reginald is #38 of Pedigree on Page 254 a distant Uncle to me. There are all kinds of spellings for Wyatt as there was no standardised spelling at the time. I would say perhaps Wiat or Wiate but not Waite as that sounds very different.